Saturday 22nd January, 2011, 9 am. It was cold and misty and the air had a magical quality as an eager group of students and teachers, lead by Ms Barkha Bhambhani and Mr Rajiv Sharma, set out for a bird watching trek. This was the second trek organised in this academic year. The students came armed with paper, pencils, binoculars, cameras, and one child even had Salim Ali’s book, ‘Birds of the Indian Subcontinent’. We started off by first identifying a Common Myna that had decided to perch on the electrical wires running along the boundary walls of the school and the Blue Rock Pigeon sitting in an alcove built into the school building wall. We traversed across muddy paths and grassy fields to an isolated area where the students settled down to quietly spot and identify more species of birds. Students encountered a Red Wattled Lapwing sitting and posing for us. They also spotted the Rufous Backed Shrike, some beautiful Rose Ringed Parakeets perched on the electric wire and some Small Wagtails, Indian Robin, Bush Chat and Little Brown Doves. Background music was provided by the king of birds, the Peacock, who made us aware of its presence but did not show up. The excitement was palpable, the curiosity overflowing and the questions endless. This was the group I took to the Parliament. After a month of letters, emails and faxes, we finally reached the Parliament Library building on morning of 20th January. I wondered if there could have been a better way to culminate the unit on Governments than to visit the temple of democracy itself! I wondered if our fist study tour could have been any more grand or majestic. My students, to the contrary, just wondered if they’ll get to meet the president! But as the tour started, after ample frisking and checking at every entry point, the serenity of this stately institute swept us all over. The students absorbed history with every breath, and learnt about their unit with every step. We were taken to the chambers of Lok Sabha and Rajya Sabha right after an introduction by Mr. Satinder, an official at the parliament. As we entered the circular building, the first thing we noticed, beyond the repeated security gates, was the beauty of the place. 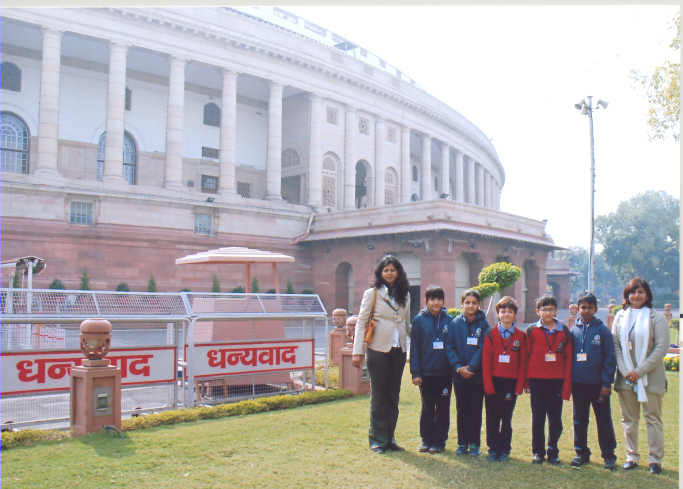 The Lok Sabha is adorned with a green carpet – to signify grass root politicians – we were told. We looked down from the visitor’s gallery, and saw the place where India is run from. Students observed the smallest details- and had a hundred questions ranging from the emblems of the princely states to the seating arrangements. Rajya Sabha is decorated with a red carpet to denote royalty, and was under repair when we reached the visitor’s gallery. But the truly awe-inspiring moment was yet to come. We were taken, soon after, to the Central Hall of the Parliament. The Podium, from where Pt. Nehru declared India free, is a place where you cannot stand without getting inspired. The different portraits that adorn the walls of the Central Hall seem to convey a message of integrity that just cannot be ignored. This was our tryst with history. Parliament Museum was our next stop. This recent addition to the Parliament engrosses you completely through various audio-visual exhibits. The students were mesmerised when they ‘walked’ the Dandi March with Gandhiji and when they became a part of the historical gathering on the midnight of 14th august 1947 hailing the Indian Independence. In so many places, and in so many different ways, they kept making connections to all that they have learned in the classroom. The students were satisfied too… While we didn’t get to meet the president, we at least we got pizzas from the parliament canteen for lunch!! IB is the abbreviation for International Baccalaureate. Schools recognised by the International Baccalaureate Organisation and offering the IB curriculum are known as IB World Schools. Pathways is conducting IB Info Sessions at all the 3 schools. Given below is the schedule. These workshops will be familiarization workshops on IB- the curriculum that our schools follow. Here we will have experts from the school talking about the benefits of IB as a curriculum, breaking all the myths around IB.